I am in heaven. I feel like all those porcelain women strutting down the red carpet, dressed (or undressed) in their elaborate, one-of-a-kind dresses, giving interviews and answering questions amidst flashes of blinding light so bright that one could be fooled into listening for the sound of thunder. I feel like I should have news crews swarming to record the moment. For once in my life, I have been nominated for an award! It isn’t a common Aria or one of those tacky Logie trophies. It’s not a boring old Pulitzer or geeky Nobel Prize. No. 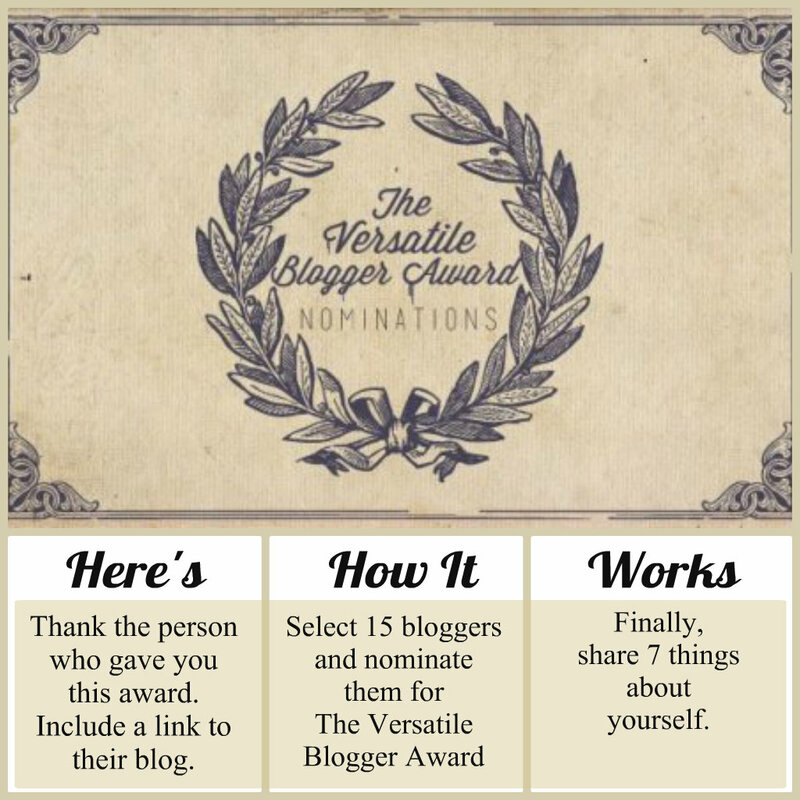 Far better than any of those, I have been nominated for the Versatile Blogger Award. I guess now is the time I am supposed to stand and give my speech – “I would like to thank the politicians and Americans for doing stupid stuff that I can rant about. I would like to thank my adoring fans, without whom this blog would not be possible. Oh, and special thanks is extended to Tasha for nominating me for this award…” Thank goodness for all those Toastmaster meetings! As we all know, every award comes with some kind of obligation. With the Logies and Arias, it is expected you will engage in the endless circle of media interviews, photo shoots and threatening letters. The Pulitzer and Nobel Prizes come with the expectation that you will continue to do whatever activity got you the award – and do it well – or face the ridicule of both the media and your peers. My obligations are much more pleasant, and infinitely simpler – I just have to tell you seven facts about myself and nominate 15 more people for their own award! It’s kind of like giving a shout-out to all my favourite bloggers. Only better. Cos there’s an award. How awesome is that? Now, let’s see. seven things about me. I am a 35-year-old, happily married mother of four. I love the feeling of cold on the palm of my hand or the arch of my feet. Watching ‘Air Crash Investigation’ made me less afraid to fly. Rather than linking to home pages, I have linked to a post I enjoyed from each blog. That way you can jump straight into the content! Thanks for the award and I hope you all love my nominated blogs as much as I do! Thank you For The Award..
7 things About me..Loving Person,Software Engineer,Code Programmer,Head of Sindh Pakistan Media Coverage of #Pti,Chelsea Supporter,Love to write something new EverDay..Thats me.. Thank you so much for this award… truly! I have only received one other award for my blog; and that was a long 4 years ago; too long ago if you ask me. 5. My family means everything to me. 7. I’m a practicing witch; and so have a strong connection with Mother Earth. Thanks for stopping by. As you know, I share your love of books, Mother Earth and all things retro. Thank you for the nomination. I’m not worthy. You’re welcome and thank you – right back atcha (^_^). Thanks so much for the nomination. I will eventually spread the love! Thanks for recognizing my blog!